I discovered the little Micromega MyAmp during the last HIFI show in Munich, and I have been rather impatient to try it out at home. Just a reminder: I have not modified the acoustic conditions in my living room in any special way. I have had this contraption in my possession for the last few days, although I should really call it an object instead because, in size, it more closely resembles a CD case than a traditional amplifier. I wanted to pair the MyAmp with speakers that seemed reasonable in both price and size to put together a system that made sense. I therefore chose to use some new Focal speakers from the Aria series: 905s, which are small and very compact bookshelf speakers. I connected the MyAmp to the speakers using the recently released MyCables, and I employed three different sound sources in the audition: Qobuz on my iPhone (FLAC files)—aptX Bluetooth connection; Qobuz on my computer (also FLAC files)—USB connection; and a CD player—the new interconnect MyCables. The first thing that struck me was the great performance of the bass, which seemed almost inversely proportional to the size of the little amp. When listening to “Noah,” performed by the magnificent vocal quartet the Fairfield Four, I rediscovered the lovely depth of the group’s resounding voices. I already had developed a strong fondness for the Focal Aria 906 model; its younger sibling, the 905, has the same rich, generous, and natural sound signature. These small speakers are perfectly suited to small spaces—10 m2 and upwards—but are unlikely to work as well in a room that is bigger than 30 m2. The pairing of these speakers with the MyAmp works especially well since the MyAmp can easily be nestled between two rows of books or CDs. The MyAmp/Aria 905 system found the happy medium between softness, structure, and dynamics: the sound produced was rich and accurate, especially when it came to the mid-range frequencies. The music’s tones were characterized by trueness and their restitution was executed with precision. The quality of the system’s sound production was particularly apparent as I listened to “Carnavale” by the Corsican group Zamballarana: a lush sound landscape spread out before me. I was pleasantly surprised by how well the aptX Bluetooth connection worked, although I had to make sure to control the source by selecting a FLAC file (CD quality). However, I would recommend playing music from a computer via a USB connection or hooking up a good-quality CD player if you want to take full advantage of the system’s abilities. This coupling of an effective amplifier and speakers with a very natural sound signature births a balanced musical output that has no equal among other systems in this price range. Together, the amplifier and speakers can be obtained for less than €1,200 (MyAmp: €499; Focal 905s: €699). This total doesn’t include the Micromega MyCables; however, they are very reasonable priced given the value they add to the system. 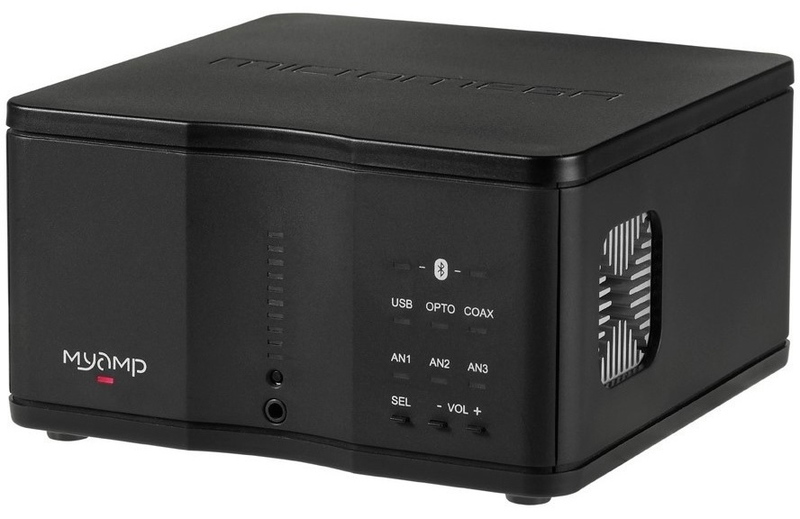 The little MyAmp’s size and performance can almost make you forget that it can also handle input from a multitude of machines: it is a hub that can connect in many different ways to a variety of peripheral devices. These include smartphones (aptX Bluetooth), tuners, CD/DVD players, satellite receivers, computers, and televisions. 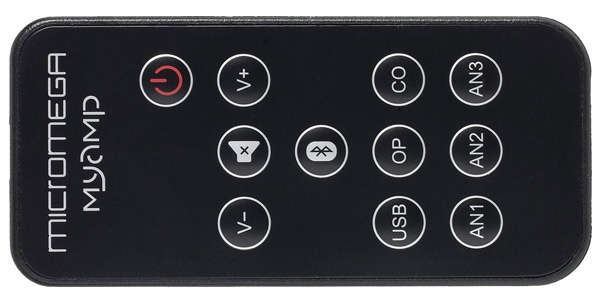 Using a credit-card-shaped remote control, it is easy to “channel surf” to select the desired peripheral device. Even after several hours of use, the amp hardly heats up at all, thanks to the cleverly designed air vents associated with the cooling tunnel that spans the box. Don’t let yourself be fooled by the MyAmp’s small size: make no mistake, it is a Class AB amplifier. Although its stature and price will naturally lead consumers to pair it with equally reasonably sized and priced speakers, my curiosity led me to go for a more ambitious pairing. I hooked the MyAmp up to two Atohm GT1 speakers. These high-performing speakers have the great virtue of bringing out the best in the most demanding electronics. The MyAmp did not disappoint me: the quality of the system’s performance was immediately discernible. The amp held its own; indeed, it nicely showcased the GT1s’ legendary sound quality. I recognize that this type of pairing is not at all sensible. Indeed, who would hook up an amplifier to speakers that cost 5 times as much? However, at least my endeavor goes to show that the MyAmp is fully capable of powering high-end speakers. I leave you to use that bit of knowledge as you will! 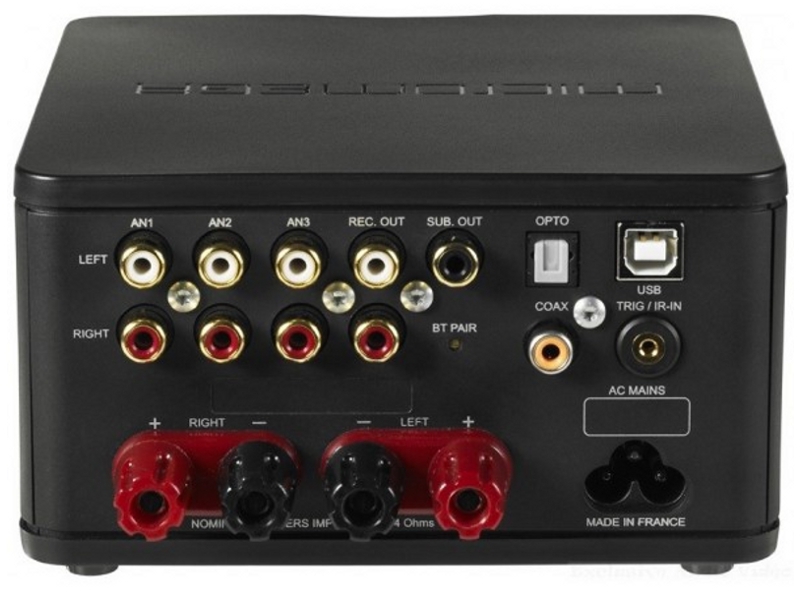 At the very least, this amplifier should be able to integrate itself into any number of reasonably priced set-ups. 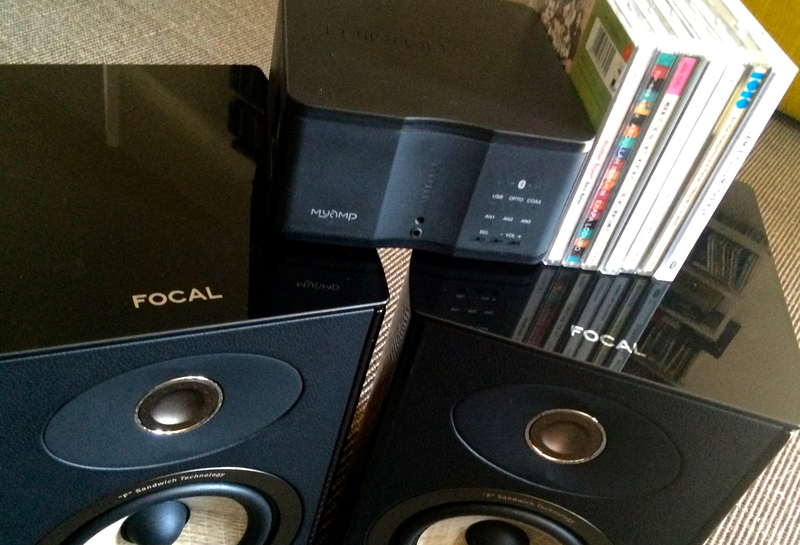 You will be surprised by the highly reliable performance of the MyAmp/Focal 905 system. If you are looking to take your first step into the world of HIFI, then this pairing may be the way to go. It may be that the multifarious features of this versatile amplifier will make a number of starter model amplifiers seem more than a little outdated. This entry was posted on 19/09/2014 by Aublanc in Amplifiers, Loudspeakers, Systems and tagged focal, focal aria, focal aria 905, micromega, micromega MyAmp, MICROMEGA MYCABLES, MyAmp, MYCBALES.